Offer optimal prerequisites for manufacturing techniques, such as for example printing of µBGA or 01005 components. SMT stands for Surface Mounting Technology, which is a specialist area in electrical engineering. In the SMT, electronic components, such as resistors or transistors, are soldered directly on a PCB using solderable contact surfaces. Since the 1980s, the SMT has been the preferred technology for PCB assembly. 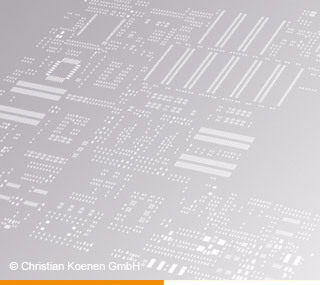 Unlike in the previously used conventional design by interlayer connection, it permits very dense assembly and, most importantly, assembly on both sides of the PCB. As a result, smaller equipment sizes and significant manufacturing cost savings can be achieved. 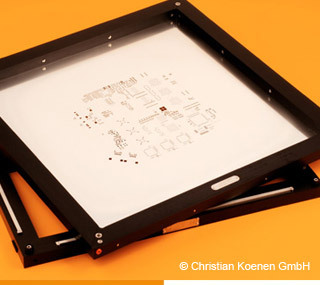 The SMD metal stencil (the solder paste or adhesive stencil) is a specialist printing tool used for SMD manufacture. The SMD metal stencil is normally a laser-cut stainless steel precision printing plate with material strengths ranging from 0.020 mm to 0.600 mm. Though other materials and manufacturing processes for SMD metal stencils are possible, the market share of these is less than 5%. Holes, so-called pads or apertures, are cut in precisely defined positions and shapes in the SMD metal stencils. In SMD solder paste stencils, the pads or apertures are a reproduction of the contact surfaces on the PCB, while in SMD adhesive stencils, they are a reproduction of the component centre coordinates. 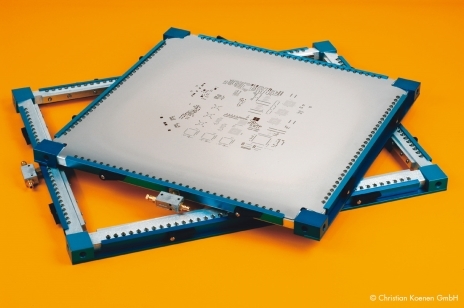 The SMD metal stencil is used in the stencil printer to apply solder paste or adhesive in exactly defined amounts and at precisely defined positions on an unpopulated PCB. During subsequent production process steps, the components are assembled on the PCB. The components are soldered together in the soldering furnace using different processes. Laser-cut SMD metal stencils are ideal for paste or adhesive printing as the pads feature a slightly conical opening towards the PCB side as a result of the laser cut, and the SMD metal stencil together with the corresponding after-treatment process (e. g. the patented electropolishing process) ensure optimum release properties of paste and adhesive. In view of the great number of variables and influencing factors, the printing process using the SMD metal stencil at the beginning of the production line offers the greatest potential for improvement of the entire line. Many variables should therefore be considered during the manufacture and user-specific optimisation of the SMD metal stencil in order to prevent errors or problems during the printing process. 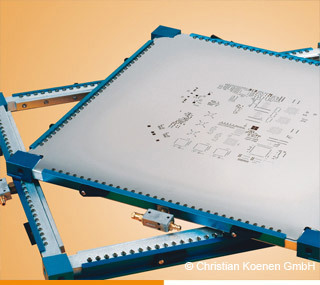 In addition, denser packing of electronic modules and the resulting smaller connecting grid along with progressing miniaturisation of components continues to increase demands on stencil manufacture. Today, SMD metal stencils must fulfil the highest quality standards through optimal fitting accuracy and cut quality. Only a fitting accuracy of ± 2 µm offers optimum prerequisites for manufacturing technologies, such as solder paste printing of µBGA or size 01005 components and adhesive printing. Aside from extensive machinery and an air-conditioned manufacture, stencil manufacturers are therefore expected to provide in-depth know-how of the entire production process. The stepped stencil is a special variant of the SMD metal stencil. Europe's largest manufacturer of SMD Metal Stencils. on everything relating to stencil and screen technology.